Hopefully, most town residents have taken the opportunity to visit the Storrs House in Longmeadow for some insight into the lifestyle of early American colonists that settled here. My wife and I have visited Storrs House (located at 697 Longmeadow Street, next door to the Storrs Library) a number of times, most recently during this year's Long Meddow Days celebration in May. We found Linda Abrams, current curator to be a wealth of information about the early days of Longmeadow. 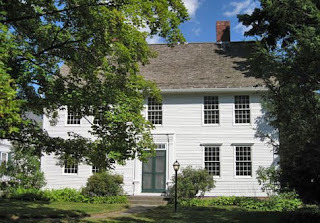 On Sunday July 19 from 1 - 3 PM and Sunday, August 16 from 1- 3 PM the Storrs House will be open for visitors. If you have not visited Storrs House, please take the time to stop by... you will find it to be very worthwhile. Visit the Longmeadow Historical Society's webpage for additional information.